The Eagles welcome Matt Ryan back home to Philadelphia as the undefeated Atlanta Falcons visit Lincoln Financial Field on Sunday at 1 pm. Sunday’s game is huge for the Eagles as they have a tough road ahead. The Eagles lost their previous two games heading into the bye week by a combined five points. In both games, the Eagles held fourth quarter leads but could not close out the game (sound familiar?). Andy Reid took care of that issue by firing defensive coordinator Juan Castillo and promoting Todd Bowles to defensive coordinator. We will see how that works out of Sunday. Reid is 13-0 coming off of a bye week as head coach of the Eagles but he has never played an undefeated team after the bye week. Through six games, the Eagles have yet to win a game by running away with it. In fact, their three wins been by a combined four points which has Eagles fans across the tri-state area clamoring for offensive coordinator Marty Mornhinweg to change his game plan moving forward. This Sunday sets up perfectly for the Eagles to run the ball. The Falcons defense is ranked 28th against the run, allowing nearly 144 yards per game. Plus, with Hurricane Sandy expected to be in the area beginning on Sunday, the rainy weather will make it difficult on anyone’s passing game. The only two games in which the Eagles had more rushing attempts than passing attempts were the wins over the Ravens and the Giants. Again, it has been suggested seemingly every week for the past 5 weeks, the commitment to the run will take pressure off of Michael Vick thus keeping him upright. Speaking of Michael Vick, he needs to do a better job of reducing his turnovers. He had another three turnovers against the Lions, a team that had allowed three turnovers all year up until visiting Lincoln Financial Field. Unfortunately for Vick the Falcons defense is good at forcing turnovers. The Falcons have intercepted 10 passes, including one that was taken back for a touchdown by former Eagle Asante Samuel. They have also forced nine fumbles and recovered seven of them. Vick needs to be aware that there will be a lot of pressure on him to control the turnovers but get the ball out of his hand quickly as well. Defensive end John Abraham has six sacks on the year and defensive coordinator Mike Nolan will keep the Eagles guessing with his different blitz options. The Eagles offensive line, which has struggled this year, needs to be prepared for the Falcons trying to confuse. Against Peyton Manning and the Broncos in Week 2, the Falcons did not get set until right before the snap to hide their formations from an audible at the line of scrimmage. Vick has been a pocket passer this year as 90% of his attempts have come from inside the pocket and he has only seven completions outside of the pocket. This year the Falcons offense revolves around former 3rd overall pick Matt Ryan. In years past, the Falcons have relied on the run and, in particular, bruising running back Michael Turner. Ryan is fourth in the NFL in touchdowns (14), fifth in completion percentage (67.8%), and tied for 11th in passing yards (1,756). As a team, the Falcons are the eighth ranked passing offense in the league. Ryan runs a smooth no-huddle offense and is confident in the pocket. He is clearly the leader of this offense and he proved it each of their last three games by leading fourth quarter comebacks. Ryan takes shots deep down the field which actually works in the Eagles favor. Eagles’ opponents are completing just 31% of their passes of 15 yards or more which is the best mark in the NFL. His top targets are big, big guys. Tight End Tony Gonzalez (6’5” 247 lbs.) leads the team with 43 receptions. Wide receivers Julio Jones (6’3” 220 lbs.) and Roddy White (6’0” 211 lbs.) have 30 and 37 receptions respectively. Ryan likes to spread the ball around to these three receivers. Gonzalez and Jones have been targeted 54 times each and White has been targeted 53 times. Each of the three has four touchdowns. White and Gonzalez each have 31 first down receptions and Jones has 20 first down receptions. There is not simply one receiver to focus on for the Eagles defense this weekend but three receivers. It will be interesting to see how new defensive coordinator Todd Bowles blitzes and adjusts to the Falcons over the course of the game. As it has been mentioned before, the weather appears like it will be a factor in Sunday’s game. If the passing game becomes an issue and both teams are forced to use their ground game, the Falcons might struggle. In their last game on October 14th against the Raiders, Turner had 11 carries for 33 yards. The Falcons rank 29th in the NFL in rushing averaging just 86.5 yards per game. By comparison the Eagles rushing defense is ranked 13th in the NFL. The Falcons will look to go to the air with their attack. This game will feature two of the most accurate kickers in the NFL. Eagles kicker Alex Henery is 11-for-12 on field goal attempts this year. Falcons kicker Matt Bryant is 13-for-14 on field goal attempts, including the game winning 55 yard field goal against the Raiders in Week 6. If Bryant’s name sounds familiar, it should. Bryant hit a NFL record-tying, game winning 63 yard field to beat the Eagles 23-21 when he was with the Tampa Bay Buccaneers in 2006. I don’t think the Eagles are going to play a clean game for the simple fact that they have played only one clean game all year (vs. the Giants on 9/30). 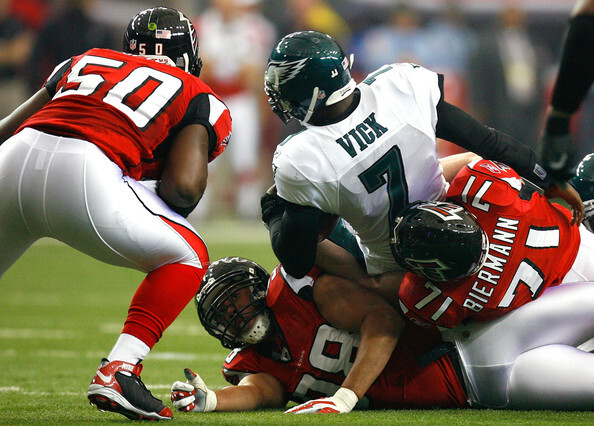 The Falcons are going to pressure Vick and the Eagles offensive line. I expect the game plan to feature a decent dose (I can’t say heavy dose because Andy Reid and Marty Mornhinweg still run the offense) of LeSean McCoy and a lot of three step drops and quick throws from Vick. On the defensive side of the ball, I expect to see a constantly changing defense with blitzes and…. Wait for it…. Sacks! If Carolina Panthers defensive end Charles Johnson was able to sack Ryan three times while his teammates got to him another four times, I think the Eagles break their sack drought in a big way this week. The Eagles and, more specifically, Andy Reid need this game way more than the Falcons need the game. I do not think it is a stretch to think that the Eagles play like a team backed up against the wall. Despite the Falcons talent, and this will not be an easy game, I think the Eagles win.